Happy Bird Hops up Branch from Wong Kiew Kit on Vimeo. This entry was posted in Uncategorized on November 21, 2017 by Wei Joo Lee. My relationship with my father has always been tense. But since a couple of years, my father has tried to get closer to me, my brothers and sisters and our children. Last week, my boys and I went to my father’s house. We had a tremendous time. It is great to know of your improving relationship with your father. Not only you should make full use of this opportunity, you should also subtly encourage your other brothers and sisters to do so. It is a wonderful blessings you must not miss. You must do so subtly, certainly not overtly. For example, whenever topics of conversations touch on your father, and he is not physically present, or on anybody’s father, mention that one must be grateful to his parents even when the parents might not have been caring to the children. 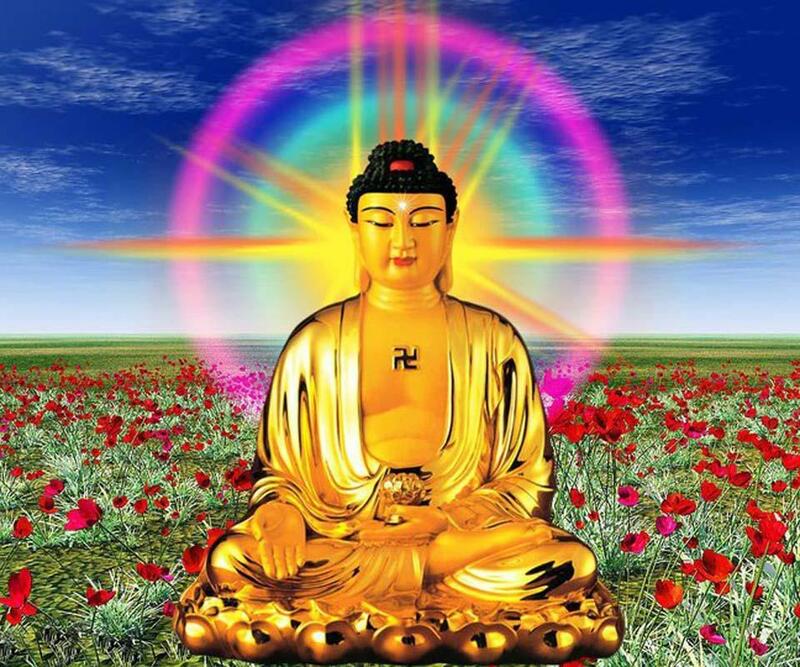 The Buddha teaches that even when someone carries his invalid father or mother on his back and takes him or her about everyday for 500 lifetimes, he has not repaid the debt he owes to his parents. What a blessing you have when your father is still healthy. Your relationship with your father should be such that when the time comes for him to leave this phenomenal world, you can with satisfaction say to yourself that you have been kind to your father. On another issue, my daughter is in love with a man who is extremely abusive, emotionally and physically to my daughter. A couple of days ago I had the chance to talk to a very good friend who has the ability of clairvoyance and she told me she could see that my daughter was under a black spell of voodoo. She said she could see black candles and some black strings attached to her. Her advice was to wake next morning at sunrise and perform some form of ceremcny with a sword to cut off those strings, which I did. Can you please advice how I can continue helping my daughter from these very bad influences? It is an excellent idea to use a sword to cut off the invisible strings that tie your daughter. You can also extinguish the black candles with the sword or by blowing with your mouth. You can also do the following. If you can, chant some blessings onto some clean water, and sprinkle it around her room and house. As you sprinkle the sanctified water, say a mantra, any suitable mantra like Namo Guan Shi Yin Bodh Satt, and ask in a firm way whatever bad spirits or influences to leave your daughter, your family and the house, and bless the bad spirits or influences. You can perform this holy ritual three times. If the above is not feasible, you can do the same thing in any suitable place you can find. Enter into a meditative state of mind, and visualize you are performing the ritual in your daughter’s house. I was very afraid of attacks because I experienced a childhood with physical violence . I took some classes in T’ang Soo Do but also quickly found your book “The Art Of Shaolin Kung Fu”. I did the exercises especially ones producing spontaneous chi movements. I found the exercises tamazing. Within one year I had given up alcohol and cigarettes. My body was becoming fit and strong and my mind was getting clear. I became sad, angry and depressed I tried to talk to many doctors, including Chinese medical doctors. I tried to find helpful teachers but I met only men who loved fighting and violent harm. I could not find someone like you who I knew understood what he was talking about and understood the Way. Congratulations for your success in learning from my book. I am also sorry to hear of your later happenings. From your description, I am sure you can overcome your problems. I suggest that you leave aside martial arts for the time being, and return to it later when you have become healthy and strong. Meanwhile you should practice chi kung to heal yourself. I would strongly recommend that you attend my Intensive Chi Kung Course Please see my Website for information. Many people may wonder what one can learn in just a few days. I can say from experience that you will learn a lot, in fact, more than what you need at present, and you will be able to practice on your own when you return home. Please apply to my secretary for registration. Practicing on your own at home is important. In a few months, you will be well enough to resume your martial art. I would suggest you give Shaolin Kungfu taught by me a try. 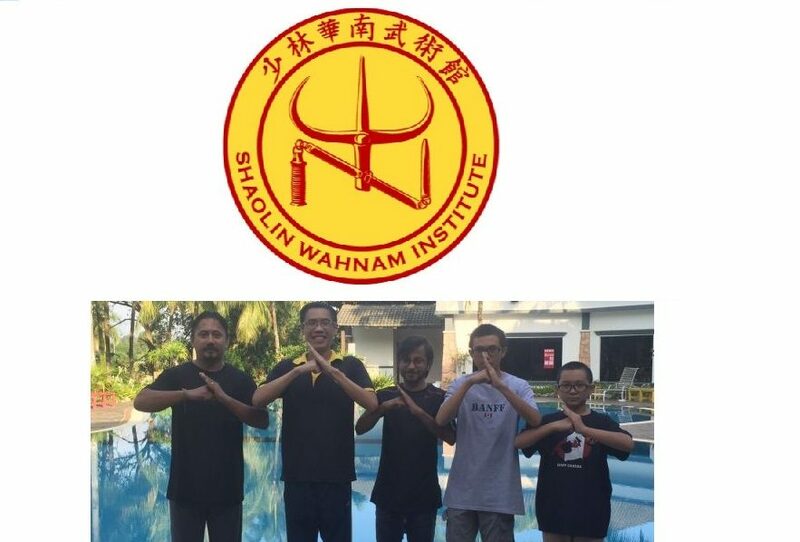 I would like to know how is the Instructor Training for the Shaolin Wahnam Institute. I have been reading in the website and I found the regional and intensive courses. But no reference for a long term training to become an instructor. If there is one, could you please indicate how many forms, weapons, style, cost, place for the training? They practice the Ten Shaolin Laws in their daily life. Their performance in their arts is good. There is a need for instructors in their area. They have attended at least once but often a few times, my intensive courses they are going to teach, as these courses provide the basic philosophy, techniques and skills practitioners of the relevant arts should know. Seniority is also an important consideration in our choice of instructors. 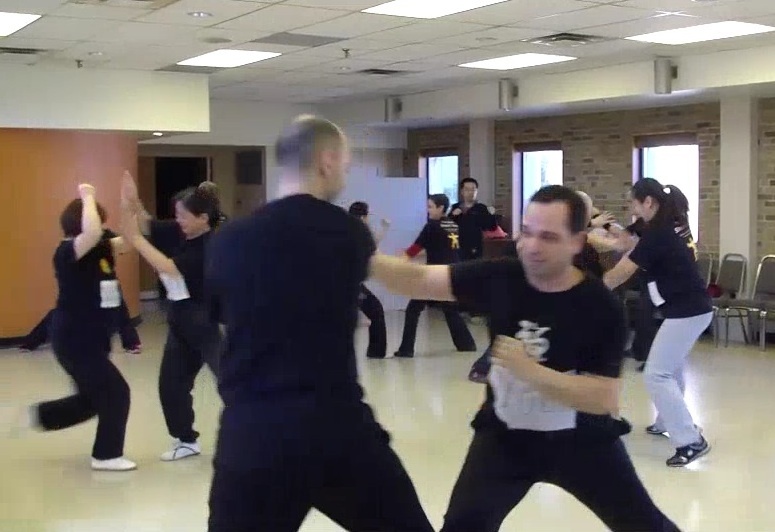 Interestingly, the factors you have mentioned, like how many forms, weapons, and styles they know are not important in our consideration, although our potential instructors normally know many forms or kungfu sets, a few weapons and a few kungfu styles. Can we eat our breakfast before chi kung practice? Many masters recommend that practitioners should abstain from eating a meal half an hour before and after chi kung practice. It is because the food in the stomach may interfere with chi flow. However, as our chi flow is powerful, we need not follow this instruction. In fact, my Intensive Chi Kung Course is held at 8 o’clock in the morning. Students usually have their breakfast just before the course. In my book, “Chi Kung for Health and Vitality”, one of the dont’s is not to take a meal about half an hour before and after a chi kung session. The book was written about 20 years ago in 1997 when my chi kung attainment was of a much lower level than now. Moreover it was written for people who might not have a change to learn from me personally. But now, those who learn from me personally, and hence their chi kung attainment is higher, have the luxury of enjoying a meal before or after chi kung. It is the same with having a shower. Many masters advise against taking a shower about half an hour before and after chi kung practice. But as our chi kung is powerful, we may not follow this instruction. We can have a shower before and after chi kung. 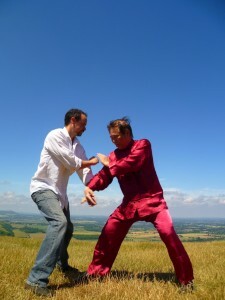 I attended a course with Sifu in England a few years back. I experienced tremendous joy after the final stage of Bone Marrow Cleansing. I have been practicing “Lifting the Sky” for depression and anxiety. Should I include Bone Marrow Cleansing in my routine? If so, how often should I do it? You should practice “Lifting the Sky” most of the time, about 8 out of 10 days. You practice Bone-Marrow Cleansing only once a while, about once or twice out of 10 days. Follow the three golden rules: don’t worry, don’t intellectualize, and enjoy your practice. Depression can be overcome quite easily with our chi kung. How many cigarettes in a day do you consider to be too much? I am struggling with depression and smoke about 20 in a day. For me, even one cigarette a day is too much. For you, I suggest 5 cigarettes a day. Within 3 months, you cut down to zero cigarettes a day. Note the phrase “within 3 months”. You may accomplish the task in 1 month. Whenever you feel like having a cigarette more than the number you have allotted yourself to, practice “Lifting the Sky” followed by chi flow. The total time of your practice should just be about 5 minutes, not 10 minutes as in a regular practice session. If you really want to eliminate your cigarette smoking and depression, just follow this plan. You will succeed. After you have quitted smoking, if you wish to enjoy a cigarette, you can do so any time. By then, you smoke because you enjoy it, not because you are addicted. .
You told me once that my depression could be cured in three months of chi kung practice. How can you be so sure? Can you see to the future? I am very sure because overcoming depression with our chi kung is actually easy. Many people have done that. If you follow my plan you will succeed. My plan is simple, and is as follows. Practice “Lifting the Sky”, or any chi kung exercise, followed by chi flow, three times a day — once in the morning, once in the evening, and once at night. Each session should just be about 10 minutes. During your practice, don’t worry, don’t intellectualize, and just enjoy your practice. I mentioned that you would overcome your depression in three months. This means any time within 3 months. You may accomplish the task in just 2 weeks. Sometimes I can see into the future. But the future is not fixed. It depends on some variables. In your xase, for example, I can see that in a month you can quit smoking and in 2 weeks you are free from depression if you really want to. But if you don’t want to, though you may say you do, you will be unable to quit smoking and overcome your depression. If you have any questions, please e-mail them to Grandmaster Wong via his Secretary at secretary@shaolin.org stating your name, country and e-mail address. This entry was posted in chi flow, Chi Kung, family, filial piety, Grandmaster Wong Kiew Kit, Kung Fu, question-answer, Shaolin, Shaolin Wahnam, Uncategorized and tagged chi flow, chi kung, family, filial piety, Grandmaster Wong Kiew Kit, Kung Fu, QUESTIONANSWERS, Shaolin, Shaolin Wahnam on August 1, 2017 by Wei Joo Lee. 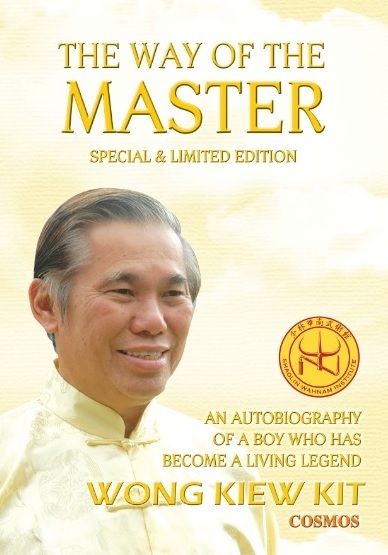 The Way of the Master, written by my Sifu, Grandmaster Wong Kiew Kit, is now officially launched. You can order the book through Amazon or write a review. You can also read more delightful stories, or order the special edition directly. There was, however, one occasion in my long learning process that I deviated from my father’s advice. Our kungfu class was preparing for a charity performance at New World Amusement Park. My master himself would perform the lion head, and everyone had expected me to perform the tail. Performing the lion tail is an extremely demanding role, for the performer has to arch his back throughout the whole performance, which in those days might last longer than an hour, and to extend both his arms in a continuous wing-flapping movement to support the covering tail-cloth. And he performed the tail so enthusiastically and so well that he was not only asked to continue in subsequent practices, but was ultimately chosen to partner my master in that charity performance, and later in other performances. Hence my monopoly as my master’s partner in lion dance was now broken – all because of my clever trick. Ah Weng continued to learn and practise hard, and progressed tremendously, often at my expense for what my master might have taught me, he taught Ah Weng instead. 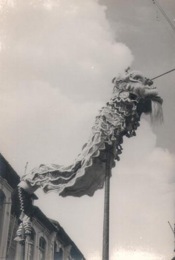 Ah Weng also became one of my master’s favourite disciples, and was the one who had learned the most lion dance skills and techniques from my master. 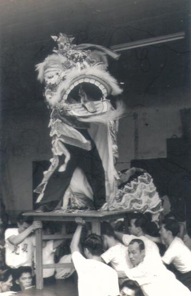 He later became a famous lion dance artist, bringing name and glory to our school. I am very proud of Ah Weng’s achievement. I also learned a very good lesson from that occasion when I tried to be too clever — a lesson that has greatly helped me in my later kungfu development. From then on, I always learn humbly and practise diligently, never be deterred by hardship or obstacles in the way. You can read more stories at our Discussion Forum. Here are details to order the special and limited edition. This edition will not be reprinted once it is sold out. This entry was posted in Uncategorized on February 28, 2017 by Wei Joo Lee. Over-training means excessive training, when the benefits derived from the training is more than the physical body can take. It usually results in over-cleansing, though over-building and over-nourishing may infrequently occur. Practitioners must differentiate between over-training and deviation. Deviation results from wrong training. The two main causes of wrong training which results in deviation are tensing muscles and worrying. Deviation seldom occurs in our school. How does one tell the difference between over-training and deviation. An effective way is to examine the symptoms. If a student first experiences benefits, then quite suddenly experiences adverse effects, he is likely to have over-trained. If he has not experienced benefits, but he experiences adverse effects straightaway, he is likely to have deviated. The adverse effects are also different. In over-training, a practitioner finds that the stuff that caused his blockage, like toxic waste, rashes, pimples, and smells, is coming out too quickly for his comfort. This may cause pain, but the pain is quite different from that of deviation. It may also be excessive cleansing of negative emotions. The practitioner may experience anxiety, fear, grief and other negative emotions. These negative emotions from over-training are also different from feeling of nausea or oppression from deviation, but the difference is subtler. What should one do when he has over-trained.? Reduce the time of training. Reduce the intensity of training. Stop training for some time if necessary. Spend the excessive energy wholesomely, like spending time with parents and friends, engaging more in out-door activities, performing kungfu sets or combat sequences, and playing games. As mentioned earlier, deviation seldom happens in our school. The very fact that our students can practice internal arts, means that they can enter into silence. The two requirements for entering silence are not thinking of irrelevant thoughts and not tensing muscles. You may now realize why not worrying and not intellectualizing are the first two of our three golden rules of practice. There are two reasons why people practice internal arts wrongly. One, they stress their mind. Two, they tense their muscles. So, to overcome deviation, just be relaxed mentally and physically. It may be a big surprise to many people that no matter what action they perform, so long as they relax their mind and body, they will have some effects of internal arts. Of course, for most people, the effects are minimal. However, if they choose special methods, like the internal art methods we use in our school, they will have better results in shorter time. In our school we have the magic of chi flow. Even when students made mistakes in their practice, their chi flow will wash away any adverse effects due to their mistakes. Here, mistakes refer to those made due to carelessness or forgetfulness. If they consciously go against instructions, like they worry despite knowing not to, they are only asking for trouble. It is best they don’t train our arts. Prevention is better than cure. An excellent way to prevent over-training is not to progress too fast, or to progress according to what your body can handle. As a general rule, if practitioners can get 30% of what they got in my intensive or regional courses, they would have done very well. I repeat: if practitioners can get 30% of what they got in my intensive or regional courses, they will have done very well. I have mentioned a few times, and I mean it seriously, what I could achieve in one year at the time when I was already a grandmaster at Shaolin Wahnam Association, a typical Shaolin Wahnam Institute student now can achieve in one month. It took me about 30 years to become a grandmaster, not only in name but acknowledged by the public to have a grandmaster’s level. If a student now works at 30%, he can attain my level as a grandmaster in 10 years. This means his solo performance is beautiful to watch, he is healthy and full of vitality, and he can defeat masters of any martial art quite comfortably. More significantly he is peaceful and happy every day. Working at 30% is actually quite a lot. There is a lot of attainment in my intensive courses and even in my regional courses. Students attain in a few days what other practitioners, even at their master’s level, could not attain in a few years. How many masters having practiced for a few years, for example, can direct their chi to flow at different levels, or develop internal force using various methods, like what our students do in a few days in our chi kung or kungfu courses? I must add that to reach the level of a grandmaster, I practiced according to what my sifus taught me at least an hour a day, everyday. So, you have to practice for at least 20 minutes a day, everyday for 10 years to reach a grandmaster’s level. If you only practice chi kung, you may practice at least 5 minutes a day. If you dream to reach a grandmaster’s level, or even a master’s level, in a month, practicing off and on, this is certainly not a school for you. Although we have become so unbelievably cost-effective that I have to tell students to work at only 30% or less, and even that is far ahead of other practitioners, consistent practice is still a must if we want good health, vitality, longevity, peak performance in daily life as well as peace and happiness. This entry was posted in Uncategorized on May 31, 2016 by Wei Joo Lee. I have been practicing Shaolin Cosmos Chi Kung for over 3 years now and i am amazed by it. It has helped me in ways that i couldn’t believe. That’s why i asked you if I could spend some time with you. At this time I’m very happy and life is good and healthy but i need to move forward. Before becoming a chi kung instructor you must first be a good chi kung student. It is very important to realize that being an instructor in our school is like being a father to your students, and to preserve our arts for posterity by passing on to your students our arts so that they too will get the wonderful benefits we enjoy, like good health, vitality, longevity, mental clarity, peak performance and spiritual joys. The main aim in becoming an instructor is not to overcome your own health problems, to move forward in life and to become rich, though interestingly all these results will be accomplished as bonuses if you are successful in teaching our chi kung. You need to be healthy first before becoming a chi kung instructor. As a teacher of an elite art, your teaching which requires that you are a living example of the art, will move you forward in life. As the fees we charge are high when compared to what most other chi kung instructors charge but little when compared to the benefits our students get, you can become rich if you have a large class. But all these results are bonuses, and not the reason why one becomes a chi kung instructor in our school. The aim is to pass on our arts to deserving students so as to preserve our arts for posterity. This means that if an instructor in our school does not move forward in life and does not become rich, but succeeds in passing on our arts to deserving students, he has accomplished the aim of becoming an instructor. Becoming healthy is a prerequisite. We do not want an instructor who himself is sick. Unlike in most other schools, a potential instructor does not have to spend a long time studying with me, though he (or she) has to spend a long time practicing the art on his own to be proficient in it. He needs to attend my Intensive Chi Kung Course as this course covers the whole range of chi kung skills ranging from a beginner’s level, which he needs to teach his beginning students at the level of the students and not at the level the instructor himself practices, to a master’s level, which the instructor is at or aspires to be. It is important that an instructor teaches at the level of his students, and not at his own practicing level. This is a teaching point many new instructors neglect. It is our school policy to appoint instructors according to seniority and usually recommended by the Chief Instructor of the country. As there are many students more senior than you, it is unlikely that you will be appointed. My practice is going very well. I have been focusing more on chi kung lately, but taking that step back seems to have taken my Kungfu to a newer level. This is natural and logical for us in Shaolin Wahnam. This was also natural and logical for past masters. In the past there was no separation between advanced kungfu training and chi kung training. Advance kungfu training was chi kung training. In other words, when a master trained kungfu, called “lian gong” in Chinese, what he actually trained was chi kung, like developing his internal force. He had long past the stage of practicing kungfu forms. Character development is for me personally the major change right now happening, and I think it’s the most important for me also. Looking back I was very weak in daily life, in everything. I am becoming harder — in my ways, my doings. In taking decisions, speaking out to people, I am becoming very straight forward, and this is fusing completely with my combat ability. This is wonderful. Indeed, this was a mark of great kungfu in the past. When master trained great kungfu, they became the best person they could be. Those who trained lower level kungfu became good fighters. I am glad that many students in our school has made this their aim, to become the best person they can be. I had special experiences. At home, one evening outside of practice, all of a sudden I felt like holding two broadswords, and I could use them and apply them in such a fantastic way. I did a sequence with these swords. I also had experiences applying a spear and Guan Dao, all the way to experiencing pushing my energy to the sharp blade of the Guan Dao. Even more amazing, I felt the difference between the weapons. The spear felt very light, and I could even sense the red cloth under the spearhead. I could basically hit any point of an opponent’s body with the spear-point. Dear Sifu, why is it that I can sense these weapons so well? I actually can still to this day sense the Tiger with me as well. People would think I’m living in a fantasy world, but I’m very much down to earth about all of this, and of course I don’t go telling people about all this, but I thought I had to share these experiences with Sifu. Yes, many people would think you have gone crazy. It is not wise to share such experiences with them. Many people do not even believe things like internal force and overcoming so-called incurable diseases, which are clearly recorded in kungfu and chi kumg classics. Either they do not believe such things are possible, or they do not believe we are capable of such abilities. They think we are crazy, or we are big liars. I asked a street fighter who won most fights about his fighting, and he told me it was very simple to be victorious. Go in and don’t stop. This brings me to our combat sequences and what Sifu has been advocating all this time. We go in with a pattern and immediately follow up with our other patterns from our sequence until the opponent is down. There is one big difference. We follow the principle of “safety first”, but they don’t. We make sure we are safe by covering our opponents adequately. Their opponents are not good at combat. As long as they move in relentlessly, they can easily beat their opponents, who are quite helpless. In the past, I couldn’t apply this strategy, because I didn’t have the correct mind state. And this is the most fantastic, the character development and life experience lead me to experiencing and understanding the mind state needed to fight, and use our Kungfu, which is just fantastic. Yes, the mind set and internal force are actually more important than the fighting techniques. The street figher, for example, does not have the techniques and internal force. He only has the mind set. Yet he is quite successful in winning fights. I want to become a world’s best fighter. What should I suppose to do? If you want to become a world’s best fighter, you have come to a wring school. Although we place much importance on combat efficiency in training a martial art, or else we shall make a mockery of ourselves, becoming a great fighter is low in our priority. High in our priority is to have good health, vitality, longevity, mental clarity, peak performance and spiritual joys. In other words, we are dedicated in our daily training not because we want to be great fighters but because we want to be healthy, have zest in our daily life, live to a ripe old age, clear in our thinking, do well in our work and play, and be peaceful and happy. If actual fighting is not high in our priority, why do we place much importance in combat efficiency? Isn’t it a contradiction? No, it is not a contradiction. We place much importance to combat efficieny because we practice a martial art. We do not want to fight if we have a choice, but if we have to fight for whatever reasons, we shall fight very well. More significantly, training a martial art enables us to gain the benefits mentioned above, like good health, vitality, and spiritual joys, more immediately and deeply. Good health, for example, represent the climax of chi kung training, but the starting point of martial art practice. In other words, practitioners in chi kung consider their training completed when they have have good health, but martial artists consider good health the beginning of their training. Moreover some desirable qualities, like mental clarity, are more urgent in marital art training. For example, chi kung practitioners normally have more time to emplly mental clarity to make wise decisions, but in martial art training when an opponent’s punch or kick is coming at you, you need mental clarity instantly to make wise decisions. Unfortunately, many martial artists today show a glaring lack of mental clarity. They do not realize that they are becoming more unhealthy the more they train, and their training does not enable them to defend themselves, otherwise they would not be routinely hit in free sparring! There are many useful things you could do. For a start I would suggest, for your own benefit, that you learn to write a letter properly. You should at least have a salutation at the beginning of your letter, and a signature at the end. You should start your letter with â€œDear Mr Wongâ€, â€œDear Sifu Wongâ€ or â€œDear Sir or Madameâ€. You should end your letter with â€œYours faithfullyâ€ or â€œYours trulyâ€, followed by your name or pen-name. This entry was posted in Chi Kung, Grandmaster Wong Kiew Kit, internal force, Kung Fu, kung fu culture, kung fu sparring, question-answer, Shaolin Wahnam, Uncategorized and tagged chi kung, Grandmaster Wong Kiew Kit, internal force, Kung Fu, kung fu culture, kung fu sparring, QUESTIONANSWERS, Shaolin, Shaolin Wahnam on December 19, 2015 by Wei Joo Lee. This is a “must see” video, recording a true history of the spread of Shaolin Kungfu throughout the world. Special thanks to Shaolin Wahnam Japan and Shaolin Wahnam Canada for producing this marvelous video! Performed live on Nov 22, 2015 at Sifu Chun Yian & Ms Swee Zhi’s wedding dinner at Cinta Sayang, Sungai Petani, Kedah, Malaysia. Special thanks go to Grandmaster Wong Kiew Kit of the Shaolin Wahnam Institute for the permission to create a rendition of his true life story and legacy. Copyright © 2015. Grandmaster Wong Kiew Kit. All rights reserved. 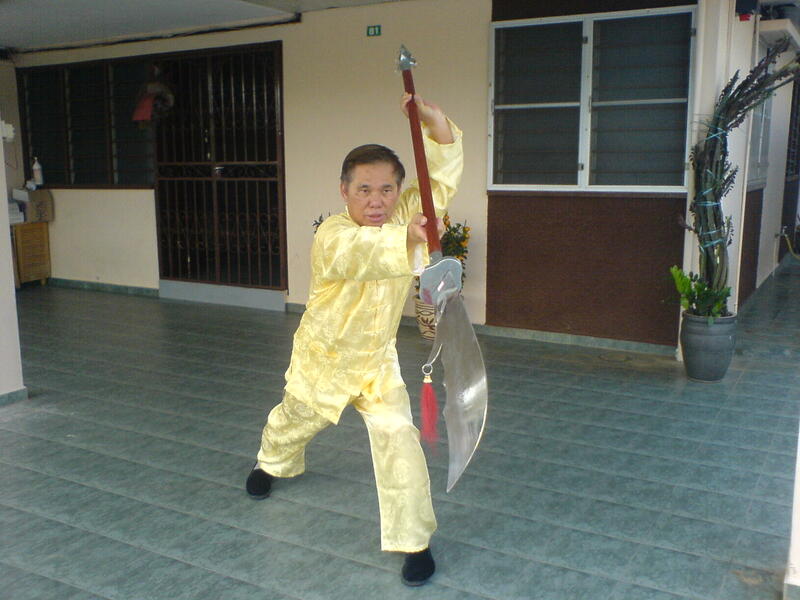 This entry was posted in Chee Kim Thong, Chi Kung, Choe Hoong Choy, Grandmaster Wong Kiew Kit, Ho Fatt Nam, Kung Fu, kung fu culture, Lai Chin Wah, Shaolin, Shaolin Temple, Shaolin Wahnam, tai chi chuan, taijiquan, Uncategorized and tagged Chee Kim Thong, chi kung, Choe Hoong Choy, Grandmaster Wong Kiew Kit, Ho Fatt Nam, Kung Fu, kung fu culture, Lai Chin Wah, Shaolin, Shaolin Wahnam, tai chi chuan, taijiquan on December 15, 2015 by Wei Joo Lee. Because I have learned from Sifu Anthony Korahais, I believe that is the proper way to address you. If not, please forgive me. Thank you for your kind thoughts and proper address. An even better way for you to address me is just “Sigung”, and not “Wong Sigung” or “Sigung Wong”. Of course you don’t mean it, but it is helpful to know that prefixing or suffixing a person’s surname by his students, like “Lau Sifu” or “Sifu Lau” instead of just “Sifu”, distant them from him. 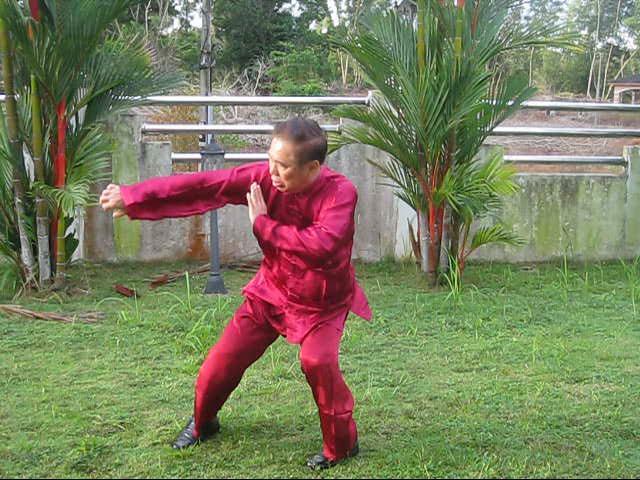 The public would call him “Lau Sifu” or “Sifu Lau”, but his students call him “Sifu”. Your case in this e-mail is different. You mentioned “Sifu Anthony Korahais” because you wanted to indicate which of our certified instructors in our school you meant. But when you talk to him, you just address him as “Sifu”, and not “Sifu Anthony” or “Sifu Korahais”. Because Grandmaster Wong has a long waiting list, these questions were received more than a year ago at a time when Sifu Anthony Korahais was still in Shaolin Wahnam. Sifu Anthony has since left the school, and by Sifu Anthony’s choice, Grandmaster Wong is no longer his sifu. 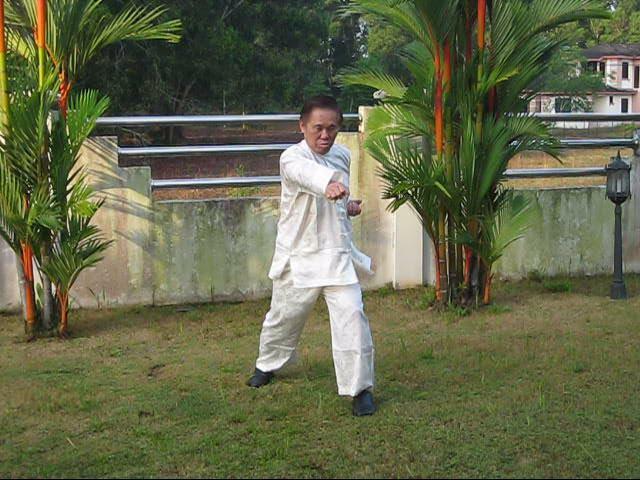 Hence, those students who used to address Grandmaster Wong as “sigung” should now address him as “sifu” if they wish to continue learning from Grandmaster Wong. They would also continue to address Sifu Anthony as “sifu”. Thank you very much for generously sharing your very valuable art. I am also particularly thankful for your website titled Showing Respect to the Master and the years of questions and answers you have archived. I am glad that many of our Shaolin Wahnam students have told me that our arts have greatly enriched their lives. Showing respect to the master is mainly for the students’ benefit. Many other people may not know this, or believe it is so. Showing respect to the master gives the students an excellent mind-set to benefit most from the master’s teaching. Many people, both inside and outside our school, have also told me that they have benefited much from my Question-Answer Series. As there is a long waiting list, these questions and answers are often posted for public reading about a year later. I would take this opportunity to mention an interesting point from the many questions I have received. Before looking at the name of the enquirer, I can often tell whether he is a member of our Shaolin Wahnam Family by just looking at the way he asks his questions. There are three characteristics that differentiate our family members from members of the public, namely mental clarity, courtesy and open-mindedness. Our family members are clear in their writing. I can easily know what they write. On the other hand, although questions by members of the public are edited for grammar and spelling before they are being posted in my Question-Answer Series, you can differentiate them if you examine closely. Clear writing shows mental clarity. I am glad our training has resulted in mental clarity demonstrated in the e-mails our students sent to me. Our family members are polite. Your opening paragraph is a good example. Some members of the public do not even bother to address the person they send their e-mails to. They just start asking their questions. And some do not state their names at the end of their e-mails. If I post their questions in my Question-Answer Series, I have to guess at their names form their e-mail addresses. Courtesy to others is an indication of self-respect. Self-respect is very important for successful living. Our family members are open-minded. They realize and accept that other people may not agree with their views which they cherish dearly. Open-mindedness is present in your questions regarding low-level Mao Shan, and regarding talking to other people about our chi kung. Being open-minded certainly make our life happier. It also enables us to improve ourselves. Once you mentioned that the form of payment for low maoshan was to be either permanently deformed, forever poor, or without children. This disturbed me greatly. I can only imagine the payment and reward associated with high maoshan. Why would anyone agree to any of those things? Is it black magic for unscrupulous people who desire quick and easy cultivation? I cannot imagine why someone would accept those terms when wonderful arts like Tai Chi Chuan and Shaolin Chuan exist. There are three levels of Mao Shan, or Taoist magic, namely low level, middle level and high level, sometimes known as black Mao Shan, grey Mao Shan and white Mao Shan. Low level Mao Shan practitioners are concerned mainly with acquiring magical powers overcoming others and causing difficulties for others, which generally result in dong harm. Middle level Mao Shan practitioners have abilities of low level Mao Shan as well as high level Mao Shan. High level Mao Shan practitioners have abilities of low and middle levels Mao Shan, and more, but are concerned with healing and helping people. Hence, the division into low, middle and high levels Mao Shan is based mainly on the application of Taoist magic, and not on the attainment of practitioners, but the tradition and philosophy of respective schools focus on these specific levels. A requirement for students to undergo training in low level Mao Shan is to choose one of the following three conditions — to be permanently deformed, to be unable to accumulate money, and to have no children. Normally people would not agree to any of these conditions, but some persons due to evil intention of various reasons may accept one of these conditions. A common condition chosen by these people is an inability to accumulate money or not to have children. Someone who has no ability or desire to earn money honorably and honestly may choose the second condition. After successfully competed his training, he can invent money and use it lavishly, but the money cannot be used the following day. Someone who wants to avenge some great wrongs done to his family may sacrifice family life and choose the third condition to take revenge. Low level Mao Shao is black magic, and can be very powerful. While many low level Mao Shan practitioners who use his magic to harm other people for no better reasons than earn money from those who pay them to do so, are unscrupulous, others are not, like those who want an easy carefree life, and those who want to avenge great wrongs. These practitioners, for example, would not use their magic on poor hawkers, or harm innocent people. While it is true that wonderful arts like genuine Tai Chi Chuan and genuine Shaolin Chuan, or Shaolin Kungfu, exist, it is also true that these wonderful arts are very rare today. Those who have a chance to learn these arts, like students in our school, are indeed very lucky. Much of Tai Chi Chuan and Shaolin Kungfu practiced today are grossly debased. It is also very rare today to practice Mao Shan, regardless of its level. Even when students have a chance, besides the conditions required by the teacher, the training is also very tough. 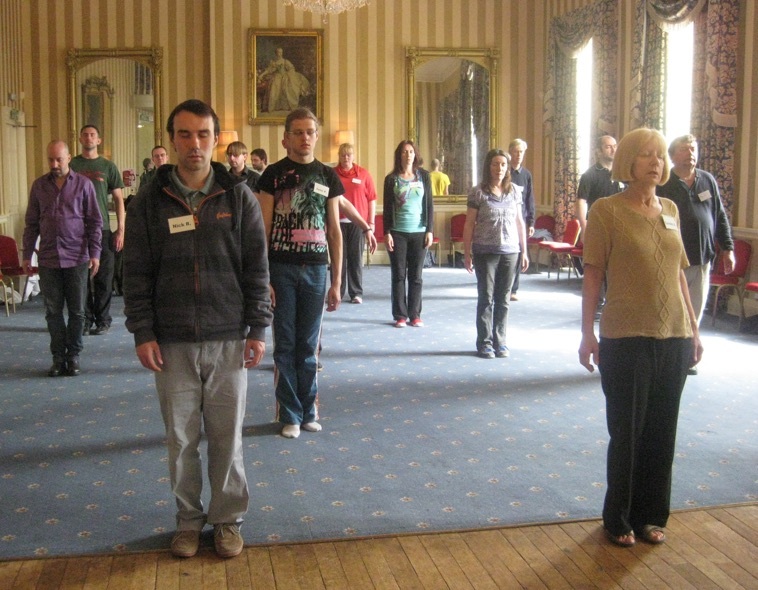 Finally, do you have any advice on speaking with other people about qigong? From reading your question and answer series, I know that many people respond unfavorably to your talking about it. I also have tried unsuccessfully to talk with people about it without results. Oddly, the people who stand to benefit the most seem to be the least interested. However, most of them act as though they didn’t hear me or I am obviously deceived. I am sad to be unable to share the great benefits I’ve received with others. 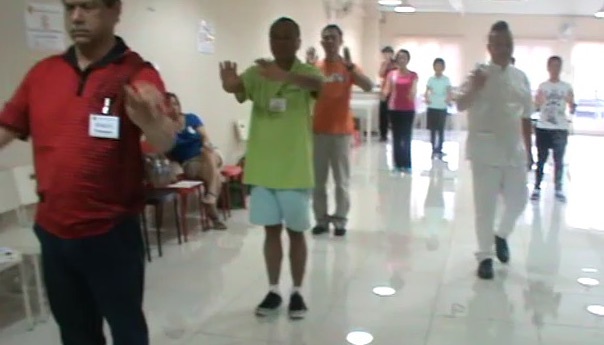 My advice is that you may talk about the benefits of qigong in general to all people. If they do not show interest, you need not continue. Only for those who are interested to know more and gain benefits themselves, should you spend time elaborating. Don’t waste your time on undeserving people. This may sound harsh, but it is good advice based on my many years of experience. While many people respond unfavorably to my talking about qigong, many other people respond favorably to it. My website, for example, is one of the top 500 most visited websites in the world. Considering that only a small proportion of the world’s people are interested in qigong and kungfu or any martial art, this is a remarkable achievement. Moreover, many of our instructors and students learned from me after hearing me talking about qigong and kungfu in my websites or books. If you talk to people interested in qigong or who want to benefit from qigong, you will have results. If you talk to people who are not interested or do not believe in the benefits qigong can bring, they think they are doing you a favour by listening to you. People whom you think will benefit most from your telling them of our qigong and the benefits you have gained, are undeserving of your time and effort. You would spend your time more fruitfully by taking your girlfriend out or finding one if you do not have a girlfriend yet, or spending quality time with your parents. On the other hand, it is their right not to be interested or to believe you, though it is not very wise of them considering the benefits you have derived from your qigong practice. You need not feel sad that you are unable to share the great benefits you have received with others. It is their choice. You should feel happy that you have the opportunities to enjoy these wonderful benefits. I was curious about some of the Baguazhang training methods used in other schools, particularly the methods I learnt from my old Baguazhang sifu before learning Baguazhang from you. His school’s fundamental set consists of Walking the Circle with the upper body held in different positions. My old sifu mentioned that doing so would train “different forms of jin” and condition the body’s strength and flexibility. Your old Baguazhang sifu was correct. Performing Walking the Circle using different positions will develop different forms of jin or internal force. For example when you use “Black Bear From Cave”, you develop “sinking force” at your palms. When you use “Great Roc Spreads Wings”, you develop “spreading force” at your arms. Using these different positions for Walking the Circle is similar to the Eight Internal Palms which I mentioned in the webpage, Brief Descriptions of Baguazhang Classics and Comments on Songs of Baguazhang, when answering questions raised by you. In the Walking the Circle we learned at the UK Summer Camp 2012, we used the Eight External Palms. We could develop internal force although we used an external method because we were skilful. Indeed, we could develop internal force no matter what external kungfu sets we used. As you are now proficient in the Eight External Palm, you can progress to using the different positions taught in your old sifu’s set when practicing Circle Walking. You will find that the internal force developed is more powerful. I experimented a little with returning to my old sifu’s set and experimenting with Circle Walking while holding my upper body in postures from the Wahnam Baguazhang Eight Mother Palms and felt my energy flow going to different parts of the body, but didn’t know if such practice would be efficient or fruitful in the long run. Yes, this practice will be efficient and fruitful. It is a development from using the Eight External Palms learned at the UK Summer Camp 2012 to using Eight Internal Palms of your old sifu’s set although the exact patterns may not be the same. You should practice your old sifu’s set the way you practice Circle Walking learnt in Shaolin Wahnam though the hand and body positions may be different. Your mind must be free from thoughts and you must be relaxed. You don’t have to worry about how to develop different forms of jin. The different hand and body positions will do that. When you use the Eight External Palms learned in our school, your energy flow goes to different parts of your body because you have generated flowing internal force. When you use the hand and body positions of your old sifu’s set, this flowing energy will consolidate into different types of internal force due to the various hand and body positions. You don’t have to worry how. The various hand and body positions will result in different types of force. It is both safer and more effective to first develop flowing force, then consolidate the force, or just develop consolidated force. Starting with the method learnt in Shaolin Wahnam, and progressing to your old sifu’s set is an excellent approach. I would appreciate any insight you might have on the practice of Circle Walking with the upper body held in various postures and how it might compare to other methods of force training, such as simply holding the Green Dragon posture in circle walking, using the “secret” method of Walking the Circle for internal force by holding a posture for a period of time, then taking the next step along the circle to hold a posture for a period of time, and repeating until completing the circle, and the master’s method of Baguazhang force training that you taught us at the Summer Camp. These are various methods to develop internal force. We are able to understand and benefit from these different methods because of our breadth and depth, which extend beyond Baguazhang, and from which we can draw inspiration and practice. These different Baguazhang methods enable us to develop internal force that can have different proportion of flowing and consolidated force. The whole range of internal force in kungfu can extend from the soft, flowing force of Yang Style Taijiquan to the hard, consolidated force of Iron Wire. Because both these styles as well as other styles of internal force, like Flower Set and Xingyiquan, are practiced in our school, we are able to draw from these styles to enrich our Baguazahgn in a way that other Baguazhang schools may not be able to. This positive transfer of skills is enhanced by my understanding and practice of Dragon Strength. Please take not that the about listing is a rough guide, and there can be variation. Some Yang Style Taijiquan practitioners, for example, may have 20% or 30% of consolidated force instead of 10%. Generally only masters may have flowing force or consolidated force. Students may use physical momentum as in Aikido, or muscular strength as in Karate, and mistake it for flowing force and consolidated force. By itself, i.e. without transference of learning from breadth and depth, Baguazhang force is about 40& flowing and 60% consolidated. 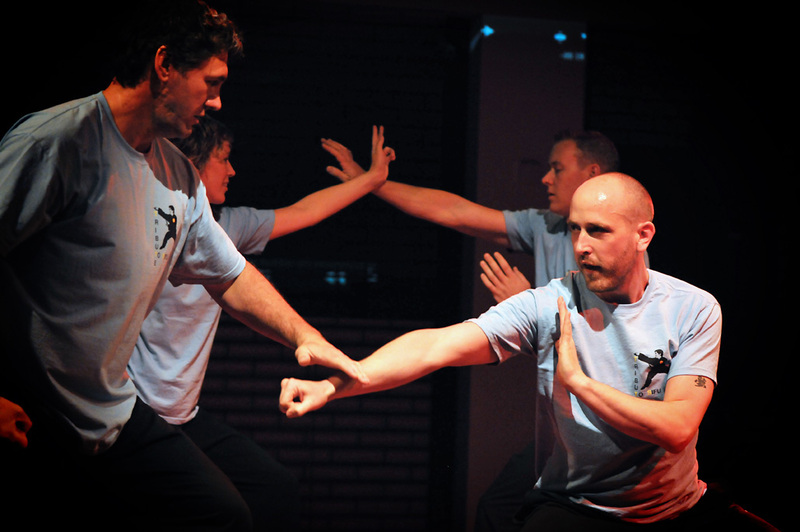 A Baguazhang practitioner who has such force is probably a master or at an advanced level. In our school, however, even students have internal force right at the start of their Baguazhang training, and due to the advantage of breadth and depth some may vary the proportion between flowing force and consolidated force. A comparison of the various methods of Baguazhang force training using Circle Walking is as follows. When the upper body is held in various postures, various types of consolidated force are developed according to the postures. When only the Green Dragon posture is used in Circle Walking, flowing force is developed, especially when various palm changes are performed at the end of a circle, like what you learned at the UK Summer Camp 2012. As mentioned earlier, it is both safer and more effective to develop flowing force before consolidated force. If a practitioner starts straight away with consolidating force, the risk of causing energy blockage is higher. If he starts with flowing force, even when he makes a same mistake, energy flow will clear away the blockage. Before energy can be consolidated, it must be flowing. This is a fact many people may not know. Hence, our students, who start with chi flow, can develop the same amount of internal force in a month whereas other students would need a year. Understandably, other people may be angry at this statement, and call us arrogant. That is their problem, not ours. Another fact many people may not know is that consolidated force is also flowing, but at a slow pace. If a practitioner locks up his energy, it becomes stagnant and forms muscles. 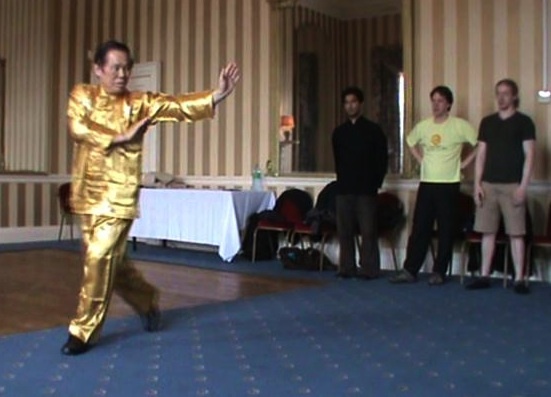 When a Baguazhang practitioner uses the secret method of Circle Walking holding the Green Dragon posture for some time, then walk the next step and hold the posture for some time until he completes the circle, he focuses on developing consolidated force, but ensures that it is also flowing. This method should be practiced only after he has developed flowing force using the mobile Circle Walking. The master’s method taught at the UK Summer Camp 2012 is a progression form this method of Stance Training in Circle Walking. It develops different types of internal force using various Eight Internal Palms, and at the same time ensures that force is flowing. It should be practice after Stance Training in Circle Waling. Mobile Circle Walking holding the Green Dragon posture. Stance Training using the Green Dragon posture in Circle Walking. Circle Walking using the Eight Internal Palms. The third level may be performed at two stages — mobile circle walking with the eight internal palms, and stance training in circle walking with the eight internal palms. In addition to developing the force for which Baguazhang is well-known, I want to sharpen the overall skill of getting to an opponent’s back to deliver a decisive strike for which Baguazhang is famous. I’ve lately been imagining an imaginary opponent coming at me with simple strikes (for example, Black Tiger Steals Heart) and then using my footwork to step to the imaginary opponent’s side and responding with one of the 64 application palms. I’ve found in my imaginary opponent and with real sparring partners that it is very easy to get to the back of an opponent who gives me a lot of force and forward momentum, but it is more difficult with a cautious opponent. Would you be able to give me some advice on how to best train the skill of getting to an opponent’s back, especially such a cautious opponent? You method of practicing with an imaginary opponent and then testing it on a teal opponent is excellent. It was the method past masters practiced to become combat efficient. This was the method I frequently practiced to remain unbeaten. It is also the method I ask our Shaolin Wahnam instructors and students to practice to win sparring competitions. If you are very fluent in executing your combat sequence, which must take into account of safety first, your opponent just has no chance against you. He will be retreating trying to cover your strikes. Occasionally, an opponent may be very skillful that he can neutralize your attack and counter attack. You make an instant modification, irrespective of whether you are attacking him from the front, side or back, and continue to subdue hum. Of course, with a cautious opponent, it is relatively not as easy to get to his back, or to attack him from any direction. There are two effective tactics for this situation. One is called “false-false, real-real”, and the other “tricking an opponent to advance to futility”. In “false-false, real-real”, which is pronounced in an impossible sound in Mandarin based on tonal values, “shi-shi, shi-shi”, you make one or two feint attacks, which can turn to be real if your opponent fails to respond. As he responds to your feint moves, you get to his back. To make your victory doubly sure, you anticipate a few possible responses he is likely to make. You make the necessary modifications and subdue him. If his response is so out-landish that you have not prepared a suitable modification, let him go and wait for another opportunity. In the tactic of “tricking an opponent to advance to futility”, which is “yin di le kong” in Mandarin Chinese, you trick you opponent to advance to attack you, but you space yourself that his attacks are futile. When he is the midst of his attacks, you slip to his side or back to strike him. Again, to make victory doubly sure, you anticipate a few possible responses he will make in that situation, and use defeat him with appropriate modifications. If his rare response is outside your prepared modification, let him go and wait for another opportunity. A little bit ago, I experimented with “Through the Woods” for fun. I began Circle Walking through the obstacles and using the obstacles as placeholders for the position of imaginary opponents and just spontaneously delivering various strikes in free flow. It was a very eye-opening experience. I felt as though I were training the skill to really deliver decisive strikes on the move, especially since the idea arose from the training that I had to be able to use just one pattern to strike someone down in a situation with multiple opponents. The patterns that came out most during my experiences with “Through the Woods” were Yellow Dragon Shoots Tongue (though from the Bagua stance, not the Bow Arrow stance), Yellow Dragon Plays With Water, Heavenly King Carries Umbrella, Golden Dragon Spirals Around Pillar, Cloud Dragon Spirals Around, and Wind Strikes Brain Gate, using the names of the patterns from 64 Patterns of Baguazhang. Are there particular patterns in Baguazhang that are more suited for fighting in a situation with multiple attackers? I noticed I was using the Bagua stance almost the entire time, not the Bow Arrow or Horse Riding stances. This was a secret training taught to me by my sifu, Sifu Ho Fatt Nam. It was extremely effective, and I once taught it at an advanced course for instructors. There are no particular patterns that are specially suited for this situation. You can use any suitable patterns. But as you are on the move, you have to strike down an opponent with just one decisive pattern, and simultaneously cover yourself adequately from possible attacks from others. You can let the patterns come out in chi flow as you go through the woods. Some suitable patterns are Yellow Dragon Shoots Tongue, Pure Blade Cuts Grass and Yellow Dragon Plays with Water. This entry was posted in baguazhang, Chi Kung, Combat Sequence, Grandmaster Wong Kiew Kit, internal force, Kung Fu, kung fu culture, Kung Fu Sets, kung fu sparring, question-answer, Shaolin, Uncategorized and tagged baguazhang, chi kung, combat sequences, Grandmaster Wong Kiew Kit, internal force, Kung Fu, kung fu culture, mao shan, QUESTIONANSWERS, Shaolin, Shaolin Wahnam, sparring on November 28, 2015 by Wei Joo Lee.